Thanks for being here today. This is a very old post from 2010. It’s actually from the beginning of my blogging days. This project cost me a total of $10.00! I had these tea cups on hand that I picked up from the thrift store. Aside from using tea cups, I also used some clear vases I picked up from the dollar tree. I simply spray painted those. Here you can see I put the copper tip at the end of the stick and then glued it to the cup.
. The birds seemed to like them, as the seed was gone pretty quickly. Deb, those are so cute!! 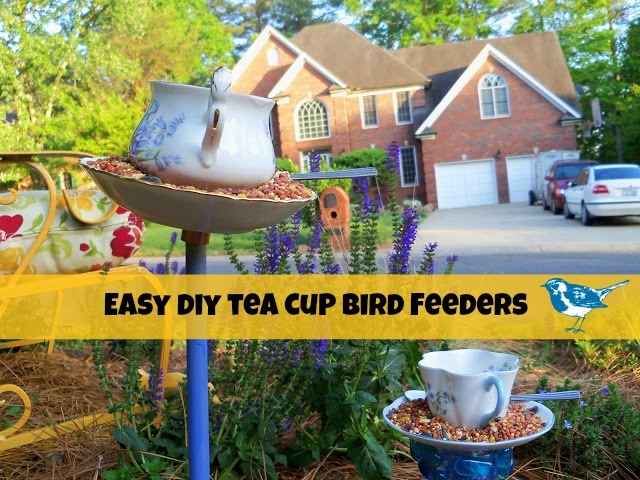 I love that idea of using teacups and saucers to create bird feeders. Aren't you the creative one!! Awww….that is just the cutest project. Love the color and creativity in the garden. I just bet you smile every time you look at the bird feeders. Debbie, those bird feeders are too cute! Love the periwinkle! Hmmm, what can I paint that color??? So glad you had a wonderful trip to Raleigh. That is one place my girls & I want to go for a weekend adventure. Can't wait to hear about your trip. These bird feeders are wonderful and whimsical for sure. How cute! It looks like something that we would see in Alice in Wonderland! I'm sure the birds will enjoy eating out of these cups. Where I live we have persistent squirrels that eat everything up. I finally bought a "Squirrel Buster! feeder. Finally the birds have something to eat! LOL Love it! Im loving that! and you put it out there near that chair I LOVE!! Great project! Debbie- those are just adorable!! I hope you post a pic of the birds enjoying them! Debbie this is such a charming idea! I've seen bird feeders like this at such expensive prices but you made them look easy to make! I'll have to look for old teacups in the thrift store and try making some..thanks! I will have to come back over–Google is up to their nasty tricks again. I can only see one picture–the one with the paint and blue vases. If they are going to play these games==they should at least let me see the finished product–don't you agree. You have the cutest things in your yard! Thanks for sharing all your darling ideas for us to copy! That is really cute. I love it next to the yellow bench. Deb! You used those pretty tea cups and glued them? To make bird feeders??!! I'm still containing my surprise. Swallowing. You stuck the spoon even?! This is SO COOL! I love it. I'll have an earth friendly DIY link thingy this Wed. and since the cup is repurposed, it qualifies. Link this one up. I'm bookmarking it for myself anyway. It's great. How pretty these came out. Each time you look out I bet they put a smile on your face. Thanks for stopping by my blog and for the nice comment. I will be following you. This is adorable!!! You should make some and sell them! A sweet hello from Frog Hollow Farm! I love this idea of whimsy in the garden – don't you just love it when you actually get to follow through on an idea that you've had for a while? I found you on Nancy's Daily Dish and wanted to stop by and say hello! Ciao, bella! What a cute idea – very whimsical! Thanks for dropping by Atticmag and for the sweet comment. Cuuute!!! If I was your neighbor I'd be stalking your yard to see what amazing new projects you'd been up to! I have tagged you, but if you don't do this sort of thing, it's fine too. How creative and charming! I love it. These are the most creative and classiest bird feeders I have Ever seen, Debbie! Not sure I could have 'gorrilla glued' such beautifull tea cups through…. LOL! Thanks for sharing!! Love, Love, Love this idea! I may snag this one, so don't be surprised if a future post links back to yours! Thanks for sharing. Oh my goodness how adorable!! I am an avid gardener and live on a little farm in the country in NJ and would love to add this to our garden!! I found you on Frog Hollow's wonderful blog and just wanted to stop by, so glad I did!! those are so cute, how clever. I've been looking for a way to intice more birds into my garden, I think I have everything I need to copy you—hope you don't mind! Thanks for the inspiriation, and for visiting earlier! I would have never even noticed the paint had you not pointed it out! This is SUCH a great idea!!! My Mother has an annual Mother's Day Tea party where we all dress up Victorian. She has a "Tea Room" in her home. SHE WILL LOVE THIS!!! I'm on a mad hunt now to find my supplies and make one for Mother's Day! Brilliant!!!! This is adorable! And so is your fun blog! Where do you get all of your ideas…you clever thing! I adore this…I guess I am going to be running around trying to find things so I can copy;)! I am going to have to quit coming here…you make me want to be crafty…is there a pill for that;)?! I love the teacup bird feeders! That is just the touch of whimsey needed for the garden for sure. I'm gonna have to use this one too! The spoon glued on adds so much more to the look too! Love it! How cute! I love how you glued the spoon in too! Visiting from Cheri's linky party. Awesome, Debbie! You need to be famous on TV, sharing with DIY or HGTV. You rock! This is such a lovely idea! I love them! too cute! oh my, is that the cutest , ever. I will of course be copying this idea post haste lol..
That is the sweetest idea. You'll have to let us know how the birds like them. Cute little bird feeders. You are very creative! wow, this is fantastic!!! so unique and creative. i'm so glad you shared it with us! Too cute- love your color choices. And I must mention that I like the new look of your blog. That is very cute! What a cute idea. Too cute- love your choice of colors. I love the new look of your blog! Your bird feeders are so stinkin cute…I think I just might copy you:) Happy NTT! Love your new header!!! How do you make that cool link bar at the top under your header? I'm pretty computer literate…but somethings stump me! Secondly, I loved the tea cup project..and would love to know what you glued on the bottom of the cup that you stuck the dowel in. (I have the Gorilla Glue) and I would love to do one of these. I have bought one..but would like to make my own. And thirdly…YOU HAVE A SYSTEM OF KEEPING UP with visiting blog?? I am having the worst time and get totally rattled when I suddenly realize I have unintentually ignore one of my favorites! I cringe! Is that what you were saying…that you have a system of keeping track?? Those are adorable! I think I need to make some. I think you just gave me the idea for presents for my girlfriends for their birthdays this year!! I have seen these cup saucer feeders on another site, and when I wanted to find them again, I couldn't. Thanks for posting them cuz I was going crazy! I LOVE the spoon as a perch- genius! I see a trip to Goodwill for cups/saucers in my future. I *love* that you even added a spoon! I see these lovely little bird feeders at craft shows all the time and keep meaning to make some! This has to be one of the cutest things I have ever seen. Thank you so much for posting!!! I plan on making them this weekend for Mother's Day gifts. Absolutely adorable! Thanks again!!!! Those are so cute Debbie! I actually used to have a little business making these and selling them to local shops. Bet you have happy birds! What a great idea! My husband has been dying to put out a feeder to lure the quail into our yard. This will do the trick! Deb, that is soooo cute! I think I'll make one for my mom for Mother's Day. I just LOVE your teacup project. I would like to pass on a Blog Award to you. Please visit http://www.recapturedcharm.com for info! Holy macanoly…those are so stinking cute. You absolutely amaze me. BTW I was at an auction last night and got a rod iron wall piece and I totally thought of you and how great it would look that bright yellow that you love! Promise I'm not some creepy stalker, I just love how your pieces have turned out!! Thanks so much for posting to the DIY Club inc. It is so fun looking through all the posts. So cute Debbie! I used to have one of the saucer ones. Now you are inspiring me to recreate it. Thank you. Hope your Mother's Day was great! Awesomely sweet and cute! The birds in my neighborhood would love this idea…my kiddos would love to make it too! Thanks for joining in at the DIY Club!